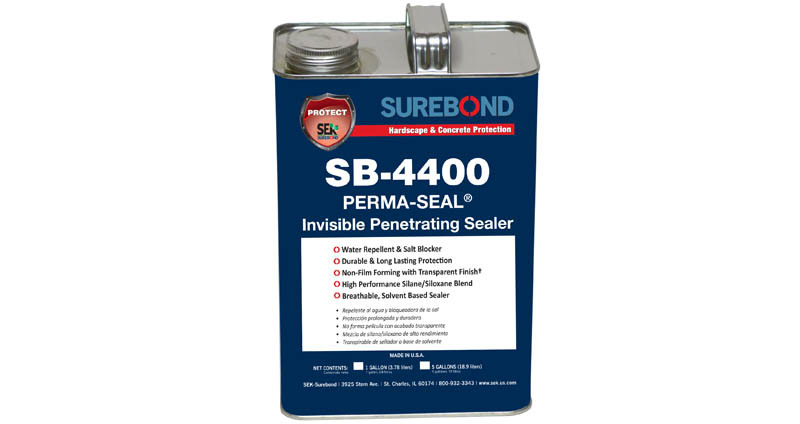 SB-4400 PERMA-SEAL™ Invisible Penetrating Sealer is a penetrating, breathable silane/siloxane blend solvent based sealer that protects horizontal and vertical surfaces from water penetration and salt damage from the use of de-icers or exposure to salt air. SB-4400 has the consistency of water and is clear in appearance when applied and dries clear with an invisible finish. Some surfaces may darken slightly. It can be used indoors (with proper ventilation) and outdoors on both new and old surfaces. SB-4400 can be applied immediately, as its unmatched breathability will not trap efflorescence. On new concrete, SB-4400 should be applied once concrete is fully cured (30 days after installation). SB-4400 requires two coats. Cured sealer is freeze resistant to -60°F (-51°C) and is stable up to a temperature of 180°F (82°C). Ideal for horizontal and vertical surfaces including concrete, concrete and clay pavers, grout, unglazed tile and terra cotta. Suitable for cultured and natural stone containing quartz or other silicas. Not recommended for granite, marble, limestone, slate, agglomerate tiles and surfaces with a high gloss finish as they do not absorb the sealer. A test area is always recommended to determine product suitability and compatibility with your specific surface before use and also if desired results are achievable. SB-4400 may slightly darken some surfaces. Due to the inherent variability of natural stone and clay products, long term performance may vary. Please consult with us prior to sealing if there are concerns. Per gallon. Two coats applied wet-on-wet at right angles to first coat. Use approximately two thirds of the estimated amount on the first coat and one third on the second, ensuring saturation. Actual coverage may vary depending on the type, age, condition, porosity of the surface, application method and other local conditions such as temperature. Click below to open up the tab to reveal more information. TEST FIRST on a small inconspicuous area to determine the suitability and if desired results are achievable with this product on your specific surface. SB-4400 may slightly darken some surfaces. On new concrete, SB-4400 should be applied once concrete is fully cured (30 days after installation) to ensure optimal performance. The surface should be thoroughly clean and free from oil, dust, loose material, and previously applied sealer other than SB-4400 prior to sealer application. If needed, prepare surface with Surebond Cleaners before sealing. Thoroughly rinse all cleaner residue prior to sealing. After cleaning or rain, wait 2 hours after the surface is dry before sealer application. A leaf blower is recommended to remove dust, debris and fine sand particles from the surface. 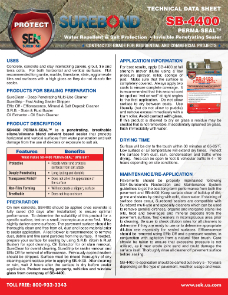 Protect nearby landscape, vehicles, buildings and window glass from overspray of SB-4400. Apply when day and night temperatures are between 40°F – 95°F. Avoid windy conditions to keep sealer spray from drifting. NO pre-blending or mixing required. For best results, apply SB-4400 at full strength (never dilute) using a low pressure sprayer, roller, sponge or pad. Make sure that the surface is completely saturated. Always apply two coats to ensure complete coverage. It is recommended that this second coat be applied “wet on wet” at right angles to the first application. Do not allow surface to dry between coats. Use liberally (but do not allow to puddle) and remove excess immediately with foam roller. Avoid contact with glass. If this product is allowed to dry on glass a residue may be created that is not removable. If accidentally splashed on glass, flush immediately with mineral spirits or other solvent. Re-applications may need to be carried out every five to ten years depending on environmental conditions such as weather and volume of traffic. NOTE: Application of this product is out of the control of SEK-Surebond. Application steps should be followed completely and accurately. Should a problem occur with this product, SEK-Surebond limits liability to product replacement only. Buyer assumes all risk and liability resulting from the use or misuse of this product. Surface will be dry to touch within 30 minutes at 65-85°F. Low surface or air temperature will extend dry times. Protect the surface from dust, rain, condensation and traffic while drying. Area can be open to foot & vehicular traffic in 4 – 10 hours depending on site conditions. For tools and equipment, use mineral spirits or other solvent. 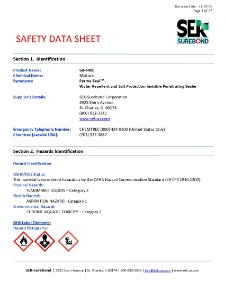 Become a Certified Surebond Applicator. We are a privately owned manufacturer of premium hardscape accessory products, headquartered in St. Charles, IL and distribute products internationally through hardscape distributors. Our products are made in the U.S.A. with pride. Thank you for excellent products and employees! Thanks again for all the wonderful help. WOW! This product is AMAZING!!!! …quite pleased with the excellent customer service. Lots of companies preach "making customers for life" - very few come close - SEK now has an army of one! Thank you so much for the awesome customer service!